This section covers some other important aspects of surfactants; either those that continue the HLD-NAC theme directly, or those which offer future challenges for HLD-NAC, and those where some surfactant science can naturally be captured in app format. One of the first things needed for any navigation is to know where you are. The HLD tells you where you are in surfactant space.Usually you find that you are in the wrong part and have to shift the oil or surfactant blend to get into the right part. But what is "right" in the following cases? It is often desirable to keep (via surfactant molecules) a low level of hydrophobic molecules in a stream of water flowing past metal pipes in case any part of the surface of the pipe gets damanged, exposing fresh metal which can then corrode. If the hydrophobic molecules are attracted to the fresh metal surface they can then protect the surface from the water. Clearly if the molecule is too "happy" in the water it will not be attracted to the metal surface. If it is too "unhappy" it will accumulate into large oily balls which then have a very low surface area to volume ratio so are unlikely to find a freshly-exposed metal surface. The trick in formulating such systems is to get the HLD close to 0 so the droplets are very small and have a low interfacial energy making it easy for them to flip onto the surface and provide the required protections. The situation is similar to corrosion inhibition. A monolayer of the right polymer needs to deposit automatically onto a surface to reduce drag. If the system is too far from HLD=0 then it will either deposit as a big lump or be too stable to deposit. The oil industry spends more than $200m each year to prevent the formation of methane hydrates or, if they form, to make sure they don't plug the pipes. The hydrates start off as shells around the water drops in W/O emulsions and can gradually build up to create fully solid hydrate particles in oil. In general these particles are not a problem. However, if there is free water around, the drops are attracted to each other by capillary forces, the free water then turns to solid hydrate and you end up with a blocked pipe and serious problems in terms of economics and safety. One way to solve the problem is to inject large volumes of alcohols to shift the hydrate formation equilibrium; this is obviously very expensive. Another way is to add small amounts of polymers such as PVP or PVCap which can act as efficient kinetic inhibitors; but "can act" is not the same as "always act" - and proving that a kinetic inhibitor works is obviously difficult - if you test for x minutes how do you know that formation won't start at x+1 min. Another way to ensure that the W/O drops don't cause big problems with hydrates is to ensure that they are particularly stable, with the minimum amount of (expensive) additional surfactant. As we've discussed in terms of classic emulsions, the maximum stability is when the HLD is somewhat greater than 1. 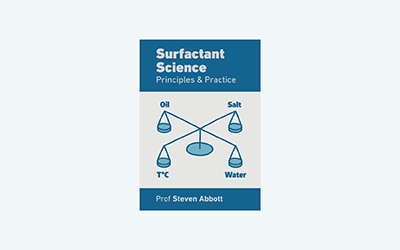 If it's much greater than 1 then the surfactant is likely to be happy simply being dissolved in the oil and therefore not stabilising the interface. So, the right surfactant can do a good job in avoiding hydrates - but then cause a different problem in downstream processing when we want the HLD to move rapidly to 0 to allow demulsification. It requires a good understanding of the whole of HLD-NAC to work out the right balance of surfactants for these competing requirements - with temperature a key parameter at different stages of the process. Yet again it seems that the Salager group is setting the scene for thinking through these complex issues. See Jean-Louis Salager and Ana María Forgiarini, em>Emulsion Stabilization, Breaking, and Inversion Depends upon Formulation: Advantage or Inconvenience in Flow Assurance, Energy Fuels 2012, 26, 4027−4033, for a recent paper and a more general review of the issues in collaboration with the famous Center for Hydrate Research in Colorado, Luis E. Zerpa, Jean-Louis Salager, Carolyn A. Koh, E. Dendy Sloan, and Amadeu K. Sum, Surface Chemistry and Gas Hydrates in Flow Assurance, Ind. Eng. Chem. Res. 2011, 50, 188–197. There are some complexities here. We want the surfactant to be good at keeping the water drops distinct (so water doesn't "leak" out between hydrate particles) but we also want the hydrate particles to be surrounded by surfactant so that they remain distinct. What is the perfect surfactant for a hydrate particle? That's perhaps a question more of academic than practical interest. You don't get a chance to inject the perfect surfactant once the hydrate particles have formed (it's too late by then) so you have to hope that a surfactant that wraps around an oil drop and provides stability (via steric or elastic effects) will also keep the hydrate particles adequately isolated. At higher concentrations, many surfactant/water/oil systems form liquid crystalline mesophases. These more rigid phases are either desired (e.g. to add viscosity to stabilise an emulsion system) or, more often, disliked for stopping formation of the right sort of well-behaved emulsion. To understand mesophases requires a full phase diagram, often looking in areas of very high surfactant concentration that are generally of little interest to the practical formulator. Happily, HLD allows us to pinpoint key parts of the phase diagram in areas of relatively low surfactant concentration and with typical oil/water ratios. Unfortunately, though, these parts of the phase diagram aren't immune to mesophases so the best predictions of HLD can be upset if the thermodynamics strongly favour a complex mesophase. The practical formulator can merely hope that future developments of the theory will allow this aspect to be incorporated into a handy app. Because foaming (deliberately creating or destroying it) is so important in surfactancy, it would be wonderful if HLD could be applied to it. However, the key interface is water-air not water-oil so, for once, HLD doesn't seem to be able to help navigate through the issues. Instead, speed of getting to the surface (see Dynamic Surface Tension) and toughness of the interfacial film (perhaps somewhat related to ξ) are the key drivers. We all know how easy it is to wreck a perfectly good formulation by addition of, or the change of, a single raw material. HLD is one way to quickly diagnose what might be going wrong. If you have cleverly formulated to be very close to HLD=0 then it is possible for a raw material to tip you from one slightly negative to slightly positive, wrecking your formulation. A hydrophilic contaminant in an oil can reduce the EACN, a slight change in one surfactant can change the overall Cc, the "same" material might come with a higher or lower salt concentration that the supplier fails to mention. If you have no idea of your HLD, then you have no idea how to diagnose such an effect. Of course there are many other ways for things to go wrong. A classic example is shampoo formulations. Marketing ask you to switch from wheat protein to rice protein (so they can claim the shampoo to be gluten free), and despite the fact that one (hydrolysed) protein is much like another, the formulation falls apart. If the surfactant is anionic and the new protein happens to have a higher percentage of cationic amino acids then it's possible that the cations clump with the anions and destroy the surfactancy (i.e. change the overall Cc). So even though HLD knows nothing of hydrolysed proteins, it can help the harrassed formulator to come up with ideas for why something has gone wrong. Failure can also be in terms of storage; a great formulation falls apart after a few months. The basic theory of creaming and Ostwald ripening helps the HLD formulator to guard against some effects. But a typical problem arises with ethoxylated systems. If the sample experiences a higher temperature during storage, the Cc can change dramatically because of the large temperature coefficient. This can be enough to tip the balance from stability. By formulating with something like an APG which has no temperature coefficient, such heat-induced failure becomes impossible.